Did you know that it’s Handspun February? Christy said so. C’mon and join the fun! I’ve been dabbling in spinning for awhile. 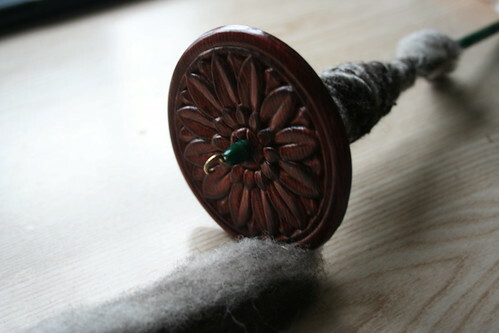 I love my spindle from spinsanity. My novice status hasn’t stopped me from approaching fiber with the same zest I approach knitting and yarn. I have managed to accumulate a stash in a rather small amount of time. In addition to the orange batts above, and some equally lovely batts named “Scutterbotch” (which is every bit as lovely as it sounds), I also have acquired some roving from Stephanie at Spinning Colors. Mmmmm. It’s “Chocolate Morsel” BFL. It’s what I’m currently spinning, 10 minutes at a time, and I love it. I have more of Stephanie’s fiber, plus a few ounces here and there of other goodies I’ve picked up along the way. And I somehow managed to get into the Hello Yarn fiber club this go-round. And, since I can never do anything new only partway, I even signed up for a Funky Junkies spinalong/sweater-along. 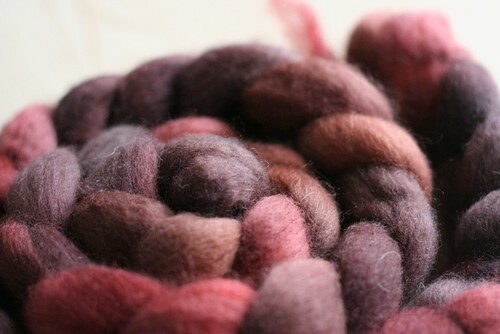 So I’ll be getting more yummy funky carolina fiber; I plan to make a pair of vests for the boys. That’s not too much is it? Okay, I realize that maybe it is, especially on top of my regularly scheduled knitting. But I plan to approach it ten minutes at a time, at least once a day, and we’ll see how it goes. 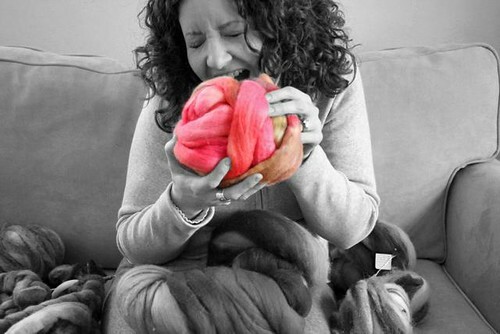 As the world turns grey and white outside, I console myself with a colorful fiber diet! Cool effect in that picture. Ooo, I can’t wait to see. You have definitely acquired some pretties. I don’t really understand hand-spinning, but it looks like you’ll be having a wonderful time!! Its’ amazing what 10 minutes a day adds up to – ‘great approach! 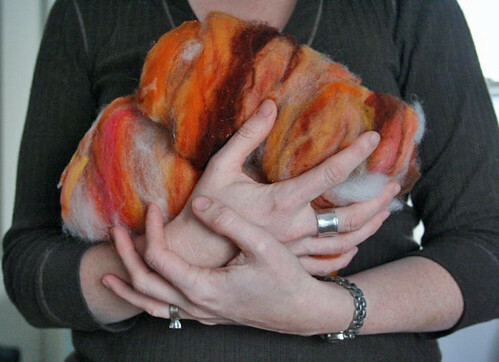 Beautiful roving. Looks like fun times ahead! I continue to successfully avoid the lure of spinning. 😉 Can’t wait to see yours! I love that last picture! And I’m sure it’s better than oatmeal for your digestion! Chew carefully,dear. Yummy! And thanks for the Handspun February link. I’ll definitely have to check it out. I always enjoy reading your blog and all the talent that you have. Thank you for sharing the beautiful things you create. I really like the vine sweater and have been looking at knitting it for a year now. I personally deemed today as leave a comment on every blog I visit. Have a good weekend.